This document sets out the terms and conditions on which we license our training DVD packages (Product or Products) to you (the Licence). Please read these terms and conditions carefully before ordering any Products. You should understand that by ordering any of our Products, you agree to be bound by these terms and conditions. The Development Company Limited (we or us) are registered in England and Wales under company number 03932440 with our registered office and trading address at Ireton House, 9 Sunnyside, Earls Barton, Northampton NN6 0EX. Our VAT number is GB 623 7259 38. 2.1 Your order constitutes an offer to us to buy a Product. All orders are subject to acceptance by us, and we will confirm such acceptance to you in writing that confirms that the Product has been dispatched (the Dispatch Confirmation). The contract between us (Order Contract) will only be formed when we send you the Dispatch Confirmation. 2.2 The Order Contract will relate only to those Products whose dispatch we have confirmed in the Dispatch Confirmation. We will not be obliged to supply any other Products which may have been part of your order until the dispatch of such Products has been confirmed in a separate Dispatch Confirmation. 2.3 These Terms and Conditions apply to the Order Contract to the exclusion of any other terms that the you seek to impose or incorporate, or which are implied by trade, custom, practice or course dealing. 3.1 Your order should be delivered by the delivery date set out in the Dispatch Confirmation or, if no delivery date is specified, then within a reasonable time of the date of the Dispatch Confirmation, unless there are exceptional circumstances. 3.2 We may at any time notify you of delays in the dispatch or delivery of the Products and may, at our discretion but only if deemed necessary, amend the dispatch or delivery dates accordingly. 4.2 Ownership of the Products will only pass to you when we receive full payment of all sums due in respect of the Products, including delivery costs. 4.3 You will be liable for the full cost of replacement of Products in the event of loss or damage, howsoever caused or arising. 5.1 The price of any Products will be as quoted from time to time, except in cases of obvious error. Prices quoted are for the Subscription Packages referred to in Section 6 below. 5.2 The prices quoted exclude VAT and delivery costs, which will be added to the amount due. 5.4 Payment for all Products must be by credit or debit card or by BACS. We accept payment with Mastercard, Visa credit card, UK Visa Debit card, UK Visa Electron, Visa Corporate, Mastercard Corporate, Maestro, JCB. (b) A one-off single payment for the purchase of and the Licence to use the training DVD and trainer’s notes. 6.2 If you have subscribed to the DVD only licence and subsequently wish to upgrade to the DVD plus Trainer’s Notes licence, you may do so on payment of the additional fee for the trainer’s notes being the difference between the two licence fees at the time of the upgrade. 7.1 If you are a company or other organisation the Licence permits you to use or make available the Products for education and training purposes to your officers, employees and those persons whose services are contracted principally to you. 7.2 The Licence is granted solely to you and does not extend to other companies, organisations, individuals, partnerships or LLPs, whether or not connected or associated with your company or organisation, group member or franchisee or otherwise, or officers or employees of such companies or organisations. 7.3 If you are a self-employed trainer or training, education or development organisation the Licence permits you to use or make available the Products for education and training purposes to those companies, organisations, groups or individuals who may from time to time engage your services as a trainer. 8.1 From time to time we may produce new scenarios for use in the Products or new versions of the Products (Updates). 8.2 The availability and price of Updates will be communicated to you and will also be clearly displayed on our website. We will from time to time inform subscribers of Updates. Updates will only be sent to subscribers once we are in safe receipt of the original Product to be replaced. Such original Product should be returned securely by recorded and tracked delivery and insured for the full value of the Product. All return costs and insurances will be paid by you. 8.3 We welcome feedback and suggestions on the Products and in respect of Updates, which will be reasonably considered, but the release and content of Updates will be at our sole discretion. 9.1 Where at our sole discretion you have been granted access by us to a Product for preview and evaluation purposes you may only use the Product to evaluate its suitability for training Permitted Users. You shall not use or make the Product available to any persons except those strictly required for the purposes of evaluating the Product. 9.2 The restrictions described at Section 10 below, apply equally to preview copies of Products. 10.1 All copyright, trade marks, design rights and other intellectual property rights (registered and unregistered) in respect of the Products and all content contained in our promotional material or on our website shall remain vested in us. (c) Sell, rent, lend or sub-licence a Product. 10.3 If a Product is in the form of a CDROM, you may not disassemble, decompile or reverse engineer the software embodied in that CDROM. 10.4 You may not charge an admission fee for viewing a Product or advertise its use outside your organisation. 10.5 You may only make a Product available at any one time on a single computer or television screen (Screen) and may not exhibit or disseminate a Product by any means of terrestrial, satellite, cable or other broadcast or by any means of network or electronic transmission. For the avoidance of doubt, you may not upload the Products or any part thereof to the Internet, an intranet site or any other broadcast network such as a live webinar without our express prior written agreement. 10.6 You may Screen the Product in more than one geographic location, subject to Section 10.5 above, provided that the audience are Permitted Users. 11.1 In the unlikely event that you receive Products which were not what you ordered or which are damaged or defective, or are of a different quantity to that stated on your Dispatch Confirmation, we shall, at our own option, make good any shortage or non-delivery, replace or repair any damaged or defective Products, or refund to you the amount you paid for the Products in question provided you notify us of the problem in writing at the address stated in the Dispatch Confirmation within 10 working days of delivery of the Products provided the products are returned to us before replacements are dispatched. Nothing in this section affects your statutory rights. 11.2 We will endeavour to refund any undisputed sums owed to you using the same method originally used by you to pay for your purchase. 12.1 We warrant to you that any Product purchased from us is of satisfactory quality and reasonably fit for the purpose for which products of the kind are commonly supplied. 12.2 Our liability to you is limited to the purchase price of the Product you purchased. 12.4 We shall not be liable to you, whether in contract, tort (including negligence), breach of statutory duty, or otherwise, for any loss of profit, or for any indirect or consequential loss arising under or in connection with these terms and conditions or an Order Contract including any losses that may result from a deliberate breach of the terms and conditions or an Order Contract by us, our employees, agents or subcontractors. 12.5 The content of the Products and any associated materials relates to various training scenarios and is provided as a guide only. The Products and related materials are provided as training aids and for the avoidance of doubt we accept no liability whatsoever for any damage or loss, direct or indirect, arising from your use or interpretation of the Products, associated materials and the content therein. 13.1 If you order Products for delivery outside the UK, they may be subject to import duties and taxes which are levied when the delivery reaches the specified destination. You will be responsible for payment of any such import duties and taxes. Please note that we have no control over these charges and cannot predict their amount. Please contact your local customs office for further information before placing your order. All notices given by you to us must be given to The Development Company Limited at Ireton House, 9 Sunny Side, Earls Barton, Northamptonshire, NN6 0EX (email: training@thedevco.com). We may give notice to you at either the e-mail or postal address you provide to us when placing an order. Notice will be deemed received and properly served 24 hours after an e-mail is sent, or three days after the date of posting of any letter. In proving the service of any notice, it will be sufficient to prove, in the case of a letter, that such letter was properly addressed, stamped and placed in the post and, in the case of an e-mail that such e-mail was sent to the specified e-mail address of the addressee. 16.1 These terms and conditions and each Order Contract between you and us is binding on you and us and on our respective successors and assigns. 16.2 You may not transfer, assign, charge or otherwise dispose of an Order Contract, or any of your rights or obligations arising under it, without our prior written consent. 16.3 We may transfer, assign, charge, sub-contract or otherwise dispose of these terms and conditions and any Order Contract, or any of our rights or obligations arising under it, at any time. 17.1 We will not be liable or responsible for any failure to perform, or delay in performance of, any of our obligations under these terms and conditions and any Order Contract that is caused by events outside our reasonable control (Force Majeure Event). 17.3 Our performance under any Order Contract will be deemed to be suspended for the period that the Force Majeure Event continues, and we will be entitled to an extension of time for performance for the duration of that period. We will use our reasonable endeavours to bring the Force Majeure Event to a close or to find a solution by which our obligations under the Order Contract may be performed despite the Force Majeure Event. 18.1 If we fail, at any time during the term of an Order Contract, to insist upon strict performance of any of your obligations under the Order Contract or any of these terms and conditions, or if we fail to exercise any of the rights or remedies to which we are entitled under the Order Contract, this shall not constitute a waiver of such rights or remedies and shall not relieve you from compliance with such obligations. 20.1 These terms and conditions and any document expressly referred to in them constitute the whole agreement between you and us and supersede any previous arrangement, understanding or agreement between us, relating to these terms and conditions or the subject matter of any Order Contract. 20.2 We each acknowledge that, in entering into any Order Contract neither of us relies on any statement, representation, assurance or warranty (Representation) of any person (whether a party to that Order Contract or not) other than as expressly set out in these terms and conditions. 20.3 Nothing in this section shall limit or exclude any liability for fraud. These terms shall not be enforceable under the Contract (Rights of Third Parties) Act 1990 by a third party. These terms and conditions and Order Contracts and any dispute or claim arising out of or in connection with them or their subject matter or formation (including non-contractual disputes or claims) will be governed by English law. Any dispute or claim arising out of or in connection with these terms and conditions or such Order Contracts or their formation (including non-contractual disputes or claims) shall be subject to the exclusive jurisdiction of the courts of England and Wales. 24.1 The Development Company Limited may submit customer personal data to a credit reference agency for the purposes of credit checking. 24.2 The Development Company Limited agrees not to give or sell any customer information to any third party for the purposes of marketing or selling. 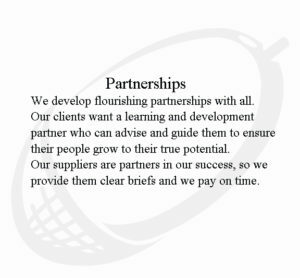 24.3 The Development Company Limited may contact the customer from time to time with special offers or information that may be of interest to the customer. The customer may instruct The Development Company Limited in writing to cease this contact.